The world's youngest chess grandmasters in history. Who Are The Youngest Chess Grandmasters In History? As we gear up for Chess.com's first ever Junior Speed Chess Championship (JSCC), many on our staff have had conversations about who the youngest and strongest players are in today's game... which naturally led to a review of who the youngest, and fastest players were to obtain the highest title in chess. Indeed it seems the game just keeps getting younger and younger! Grandmaster titles are now being achieved at twelve, thirteen, and fourteen years of age. Young talents are able to take advantage of the wealth of information, consistent and regular tournaments, and government supports on a global level. The one thing that remains from the dawn of chess is that to reach the top hard-work is still king. 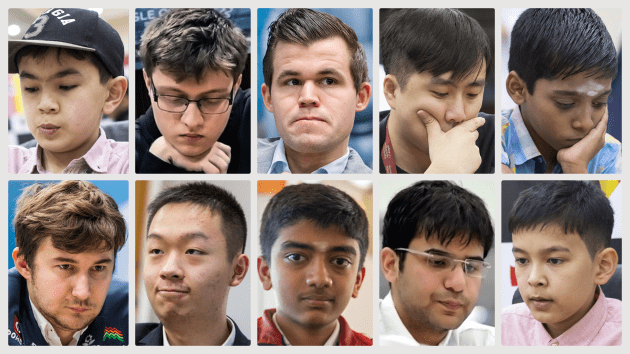 This list from March 20, 2019 showcases the top 36 youngest grandmasters. Sergey Karjakin's record still holds, with a close second with India's newest grandmaster Gukesh Dommaraju. GM Gukesh just missed out on the first place record by seventeen days! Sergey Karjakin still holds the record for the youngest grandmaster in chess history at 12 years old and 7 months! Like many children, Karjakin learned chess at the age of five, and just six years later at the age of 11 he was an international master. Karjakin has been World Rapid Champion (2012), and World Blitz Champion (2016). In March 2016 he won the Candidates' Tournament and earned the right to challenge Magnus Carlsen for the World Chess Championship. Though Karjakin lost this match to Carlsen in November 2016, he still has aspirations to challenge the champion in the future. Karjakin during one of his games at the Tata Steel Chess tournament in January 2018. | Photo: Maria Emelianova/Chess.com. Karjakin played one of the best games of his career against Caruana at the 2016 Candidates' Tournament. This fighting, back-and-forth game shows the trademark style of Karjakin. At the age of 12 years, 7 months, and 17 days, Indian prodigy Gukesh Dommaraju (or Gukesh D.) became the second youngest grandmaster in chess history. He scored his third grandmaster norm at the 17th Delhi International Chess Grandmaster Open in New Delhi, India. Gukesh's talent was spotted by his first and school coach Mr. Bhaskar, who made sure little Gukesh became a FIDE rated player within six months of learning the game! Gukesh at the 2018 Sitges Festival Chess Tournament. | Photo: Peter Doggers/Chess.com. Gukesh played his last game as an International Master, winning this game to earn his final grandmaster norm. When Javokhir Sindarov earned the grandmaster title, he was the first player since Karjakin to reach the title before he turned 13! The Uzbek youngster earned each of his three norms in one year at the 2018 Alekhine Memorial, the FIDE World Junior Championship and the First Saturday Tournament. Sindarov Javokhir making one of the moves of his game at the Chess Olympiad. | Photo: Maria Emelianova/Chess.com. Sindarov earned his final grandmaster norm at the First Saturday Tournament in Budapest, Hungary, where he recovered from a first-round loss, going on a 7/8 run in his remaining games. At the age of 12 years, 10 months, and 13 days, Indian prodigy Praggnanandhaa Rameshbabu became the then second youngest grandmaster in chess history. He scored his third grandmaster norm at the fourth Gredine open in Ortisei, Italy. Praggnanandhaa first made his name known by winning continental (Asian) championships and two world championship titles. Praggnanandhaa was also the world's youngest international master at 10 years old, a record he still holds. Praggnanandhaa at the Sharjah Masters 2017. | Photo: Maria Emelianova/Chess.com. Abdusattorov's name made headlines first when he defeated two grandmasters at the age of nine, in 2014 at the Tashkent Open. He scored his first GM norm in the 2016 Chigorin Memorial and then went on to achieve his second in Abu Dhabi in August 2017. He is by far the biggest Uzbek talent since Rustam Kasimdzhanov, who won the 2004 FIDE Knockout World Championship in Tripoli. Nodirbek Abdusattorov at the Sharjah Masters 2017. | Photo: Maria Emelianova/Chess.com. Abdusattorov earned his final grandmaster norm at the Chigorin Memorial, where he beat both GMs S. P. Sethuraman and Evgeny Levin. Now a PhD student at the Massachusetts Institute of Technology, Negi earned the grandmaster title back in 2006 when he was just 13 years old. Since he got the title, Negi has won the Arjuna Award (2010) from the Indian government, the Indian and Asian Chess Championships, and was a member of the 2014 bronze medal-winning team at the Olympiad for India. Parimarjan Negi in 2014. | Photo: Peter Doggers/Chess.com. Negi's performance in this win against GM Ragger was a fantastic demonstration on how to beat the Caro-Kann, as White's pressure throughout the game was constant. Nicknamed the "Mozart of Chess," Magnus Carlsen is in a league of his own. The reigning world champion's rating has skyrocketed past Garry Kasparov’s previous record of 2851 to an unfathomably high 2882. With fierce determination and a palpable will to win, he has dazzled fans with his ability to out-work his opponents and find computer-like moves in his games time after time. Magnus Carlsen at the Tata Steel Chess tournament 2019. | Photo: Maria Emelianova/Chess.com. While Carlsen is most known for grinding out wins in near-equal endgames, his most famous game might be his draw against Garry Kasparov, when he was just 13 years old. Wei Yi has broken all kinds of rating and age records throughout his lifetime. He is also the 2nd youngest player in history to break the 2600 rating barrier, after John M. Burke. Wei's quick progress is apparent, earning both the international master and grandmaster titles in the same year. He was the world’s youngest grandmaster when he earned the title, being only 13 years 8 months and 23 days old. Wei Yi at the blitz tournament of the Polihroniade memorial in 2017. | Photo: Maria Emelianova/Chess.com. Bu Xiangzhi earned his title in 1999, making him the youngest GM in chess history when he broke the record (Karjakin would break the record in 2002). Bu won the Chinese Chess Championship in 2004, and has since represented China in four Olympiads, including the 2018 Olympiad where China won gold. Bu Xiangzhi at the World Rapid & Blitz Chess Championship 2016 in Doha. | Photo: Peter Doggers/Chess.com. A well-known talent, Bu made more headlines in 2017 when he eliminated Magnus Carlsen in the World Cup, and then beat the world champion again in the World Rapid Championship later that same year. Sam Sevian is currently the United States' record holder for youngest ever grandmaster. Sevian's ascent to grandmaster was quick, as he broke American records for youngest expert, national master, and international master along the way. The American has played in prestigious events all over the world, including the U.S. Chess Championships, Tata Steel Chess and the FIDE World Cup. Samuel Sevian at the Isle of Man Chess.com in 2018. | Photo: Maria Emelianova/Chess.com. Check out who the brightest stars are that received our invites to this year's JSCC, sponsored by ChessKid.com, and look for more information on this event coming out soon! Only six female players have successfully broken the grandmaster barrier before turning twenty. Four-time women's world chess champion Hou Yifan also holds the record for the fastest any female player has reached the GM title, at just 14 years and 5 months. The Chinese grandmaster is the third woman to ever break the top 100 live rating list, behind GMs Maia Chiburdanidze and Judit Polgar. Hou Yifan at the 2017 Chess.com Isle of Man Tournament. | Photo: Maria Emelianova|Chess.com. When Humpy Koneru made the grandmaster title in 2002, she broke the record for fastest woman to reach the GM title at just 15 years and 1 month. In 2011, the Indian grandmaster was the challenger for the women's world championship title, where she lost to Hou Yifan. Over fifteen years later, Koneru is still one of the best female players in the world. Humpy Koneru at the 2013 Woman Fide Grand Prix in Tashkent. | Photo: Maria Emelianova/Chess.com. One of Koneru's best wins came against Peruvian grandmaster Julio Granda Zuniga, where the final position is a worthy Puzzle Rush tactic! Judit Polgar is the only female player to have ever broken 2700 and is the strongest women's chess player of all-time. Polgar is now retired, but has beaten players like Magnus Carlsen, Anatoly Karpov, Garry Kasparov, Vladimir Kramnik, and many others. Judit Polgar doing live commentary during the 2018 world chess championship. | Photo: Maria Emelianova/Chess.com. There is no game in Judit Polgar's career that is more famous than her victory over Garry Kasparov in 2002. Currently the fourth best female chess player in the world, Kateryna Lagno has broken records on her way to the top of competitive women’s chess. Lagno won the European women's championship in both 2005 and 2008, and played in the 2018 women's world championship against Ju Wenjun. The grandmaster is now set to compete in the inaugural 2019 Women's Speed Chess Championship. Kateryna Lagno at the European Team Chess Championship 2017. | Photo: Maria Emelianova/Chess.com. Grandmaster Aleksandra Goryachkina has taken the chess world by storm. At just 20 years old, the Russian grandmaster has already broken the top 10 women's list. In 2015, she won the Russian women's championship superfinal. The Russian grandmaster repeated the feat in 2017. Aleksandra Goryachkina at the 2018 Batumi Chess Olympiad in Georgia. | Photo: Maria Emelianova/Chess.com. Lei Tingjie is one of the strongest female players in China. Lei has participated in a myriad of team events for China that have resulted in gold medals: the Asian Nations Cup (2016), the Batumi Olympiad (2018) and the World Team Championship (2019). Lei Tingjie at the 2018 Batumi Chess Olympiad in Georgia. | Photo: Maria Emelianova/Chess.com. Here's a game Lei won in the 2017 World Rapid Championships with Black, a complete positional masterclass from start to finish! Do you think that these records will be broken with the new computer-powered generations? Please, let us know in the comments section.